Over the years, we have framed a very wide range of art and objects and have so brought real joy to our customers. Many picture framers avoid some of the more complex framing tasks, but at Fine Framers, we welcome all framing challenges and so have built up a reputation of framing the unusual. Now, many of the framing jobs we do are more complex “3D” projects. 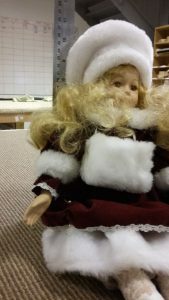 Framing a much loved doll or bear from a child’s now distant past will surely allow great memories to be relived and cherished. Many of these long forgotten family treasures , once framed, can become precious again and are guaranteed to take pride of place for many years to come. Every time it is viewed on the wall, its true long lasting value will be appreciated. We take great care when framing these objects correctly to Conservation standards, to ensure its longevity. 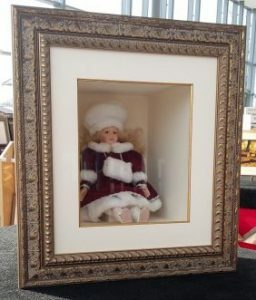 We construct a custom made “shadow – box ” to accommodate the 3D object being framed and add mounts and a frame moulding that will complement the style and colours of the framed object. At Fine Framers, we frame tomorrow’s family heirlooms – today. Give the gift that’s put on display… not put away. Find out more about Fine Framers Object Framing.